28 The PCB Design Magazine • October 2017 channel modeling software to design the final product. The benefits of this method are that it is practical and accurate—if you use the exact same material, glass style and copper foil in your final board stack-up. On the down side, a significant amount of expertise and equipment is required to design, build and measure the test coupon, which takes significant amount of time and money. But, as my friend Eric Bogatin often likes to say, "Sometimes an OK answer now is bet- ter than a good answer later." As a high-speed signal integrity practitioner and backplane ar- chitect, I often must come up with an answer sooner rather than later, because of the impact to time and cost to my clients. And that's why I have been motivated over the last few years to research and develop a simple methodology to accurately determine parameters to feed into modern EDA tools. Often the only sources are from manufac- turers' data sheets. In most cases, the numbers do not translate directly into parameters need- ed for the EDA tools. One example is modeling copper foil roughness parameters. 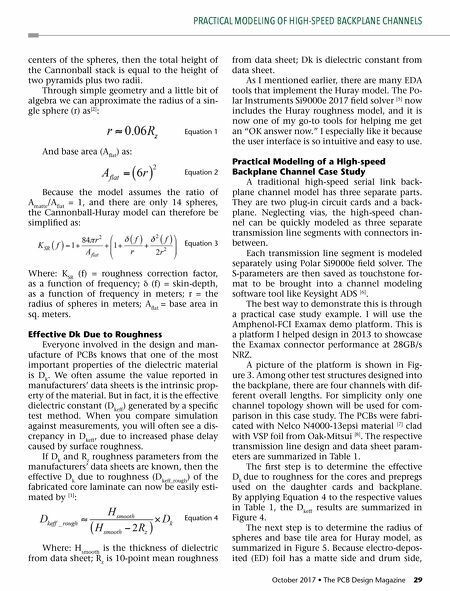 Many tools include the Hammerstad model  and more recently the Huray model  to correct conductor loss due to roughness. The Hammerstad model has been used for de- cades, since all that was required was the RMS value of the peak to valley roughness param- eter from data sheets. But it loses accuracy after 3-15 GHz, depending on the roughness of copper foil. The Huray model has gained popularity over the last few years. It is based on non-uniform distribution of spheres resembling "snowballs" applied to a matte base. Although it is quite ac- curate, it is always difficult to obtain the right parameters for number of spheres, sphere radius and tile base area. It is theoretically possible to build an accu- rate snowball model of the surface roughness by extracting parameters through detailed analysis of scanning electron microscopy (SEM) photo- graphs. But practically, it is beyond the capabili- ties of most companies who do not have access to such equipment, and doesn't help you if you want that "OK answer now." The Cannonball-Huray Model This leads into what I like to call my Can- nonball-Huray model. Using the concept of cu- bic close-packing of equal spheres, the spheres radius (a i ) and tile area (A flat ) parameters for the original Huray model can now be easily esti- mated solely by the roughness parameters pub- lished in manufacturers' data sheets  . The Cannonball-Huray model can be used to optimally represent the surface roughness. As illustrated in Figure 2 there are three rows of spheres stacked on a square tile base. Nine spheres are on the first row, four spheres in the middle row, and one sphere on top. The height of the Cannonball stack is equal to the 10-point mean roughness R Z as published in the foil man- ufacturer's datasheets. 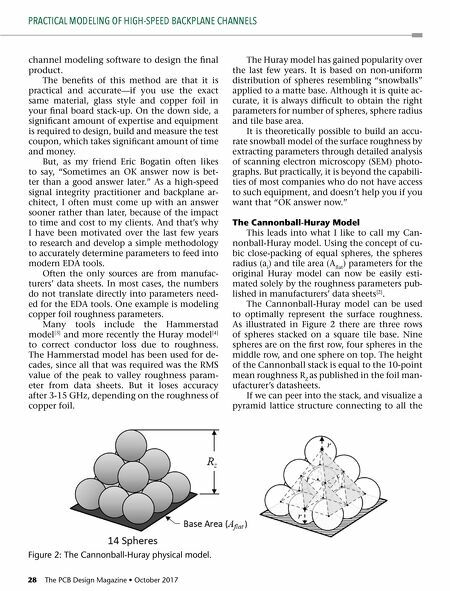 If we can peer into the stack, and visualize a pyramid lattice structure connecting to all the PRACTICAL MODELING OF HIGH-SPEED BACKPLANE CHANNELS Figure 2: The Cannonball-Huray physical model. Feature Column — When Do Traces Become Transmission Lines? Short — Hybrid Biological Cell Separations Technology for Lab-On-Chip Medical Devices.